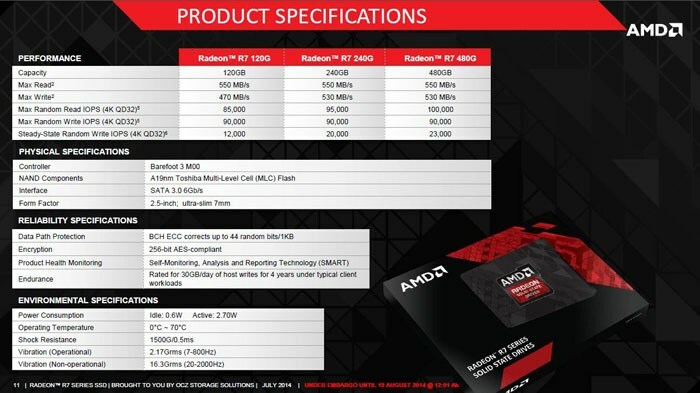 AMD already had some Radeon branded memory modules but now the company is getting ready to release SSDs as well. The Radeon R7 is a line of 2.5" SSDs, consisting of 120GB, 240GB and 480GB models. They will start shipping on August 13, 2014. As was rumored earlier this year, these disks are launched in cooperation with Toshiba/OCZ. They feature OCZ's Indilinx Barefoot 3 controller and 19nm MLC NAND flash memory from Toshiba. All three feature SATA 6 Gb/s interface, and offer sequential read speeds as high as 550 MB/s, sequential writes of up to 470 MB/s on the 120 GB variant; and up to 530 MB/s on both the 240 GB and 480 GB ones. The three offer 4K random access throughput of up to 85,000 IOPS, 95,000 IOPS, and 100,000 IOPS, respectively; with 4K QD32 steady-state throughput of 12,000 IOPS, 20,000 IOPS, and 23,000 IOPS, respectively.